Île de France, 8 May 2016. Silviu and I officially launched Project Grand Randonnée (PGR) in Île de France. 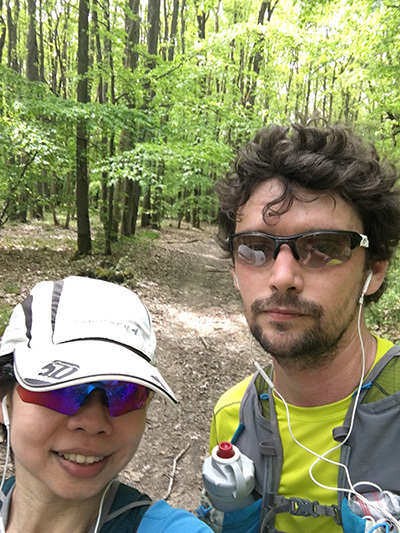 We ran 33km/D+507m from Saint Rémy-Lès-Chevreuse to Villiers-Saint-Frédéric. We plan to complete the 675km route through a series of runs. Sentiers de grandes randonnées (Long hiking trails or “GR”) is a network of well-marked, long distance hiking trails in western Europe. The origins of the GR could be traced back to 1947 in France. It has since spread to Belgium, Netherlands, Luxembourg, Switzerland, Italy and Spain. 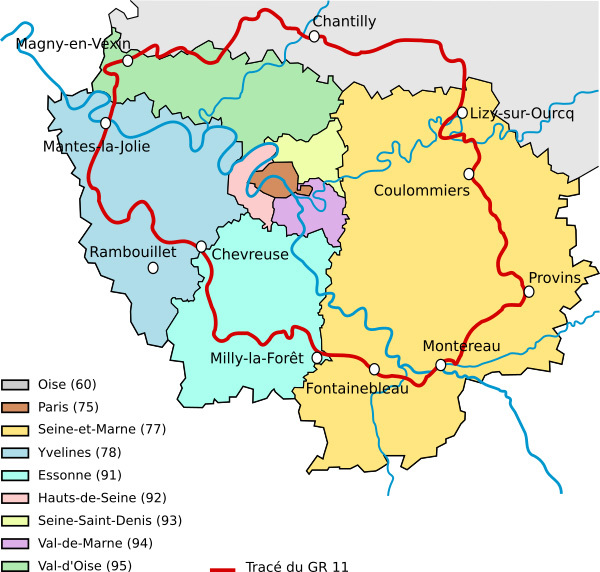 GR in France is marked by a white horizontal stripe above a red one (except in the Vosges department, eastern France) (source: fr.wikipedia.org). Well-marked route. The yellow stripe belongs to another network of hiking trails (Petites Randonnées or Short Hiking Trails). 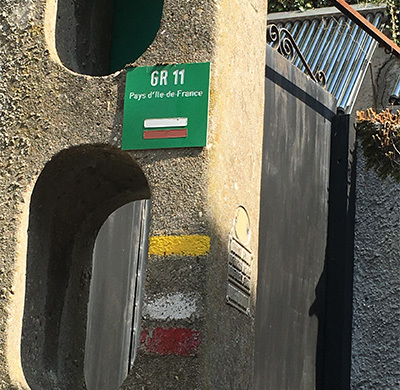 In the Parisian region, there are 2 GR routes, GR1 and GR11. Both routes circle Paris, with GR11 having a bigger loop of 675km. Since the route of GR11 is only 5 train stops away (20min) from our flat, we decide to embark our project with GR11. Greeted by cows at the start of the run. It was really a good spring day for a long run. The sky was almost clear, with patches of white fluffy clouds. It was sunny, but not too hot with temperature in the early 20s°C, and the occasional breeze lent wings to our feet. Our first run started in Chevreuse, and then moved north and covered the trails in the Yvelines department (darker shade of blue on the map above). Our first run totalled 33km, of which strictly speaking only 30.5km belongs to the official route of GR11. 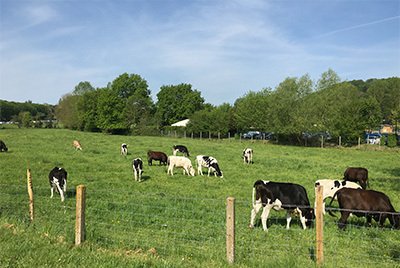 We started the run from the train station of Saint Rémy-Lès-Chevreuse (RER B) on a paved road, with a long stretch of flea market activities on our left, and a farm with cows grazing on our right. Running along the canal, passing the bridges and wash houses. 2.5km into the run, we reached the picturesque Promenade des Petits Ponts, and that was where we were on the official GR11. We ran past a short series of bridges and ancient stone-built wash houses along a canal. Panorama view of the Yvette Valley from La Château de Madeleine, at 150m. From here, we ran through the village, before ascending to Le château de la Madeleine. Since it was a Sunday, there were not many people in the village, and all the restaurants were closed. 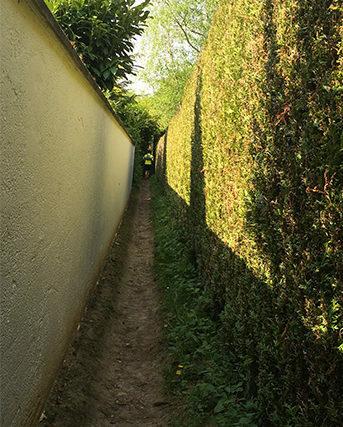 It is still a pleasant alley to run through, surrounded by greenery. The route is generally well-marked, with the white and red strips easily found on the tree trunks, signboards, and lamp posts. There was, however, one very narrow alley, not marked. Thanks to the GPX route that Silviu had downloaded onto his watch, we did not miss the tiny turn into that alley. Wish I had a house like this (Saint Forget commune)! The whole route is a mixture of paved roads, dirt roads and trails, nothing technical. 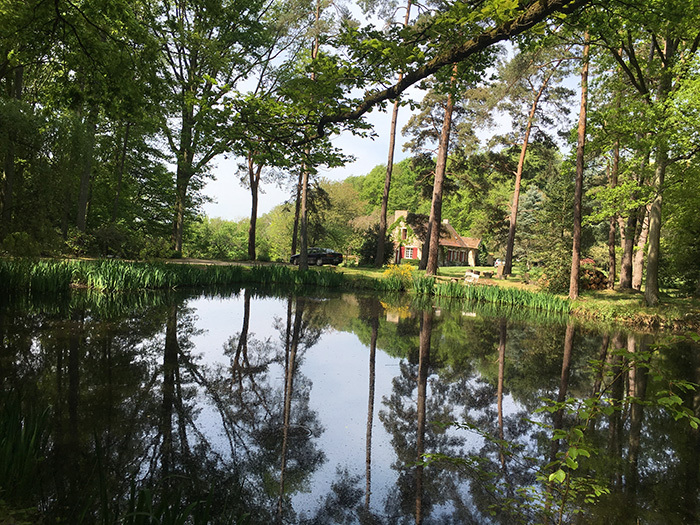 Along the way, we passed through hunting grounds, stately country houses in the forests, charming village houses along well-maintained roads, meadows, fields of yellow rapeseed flowers and young green wheat stalks, and wall memorials. This is the perfect way to explore France. It’s inexpensive (RER train ticket) and we get to discover the nooks and crannies of our new home. One of the nicer trails in La Bois Maincourte (Maincourte Forest) which is also very popular among mountain bikers. Left: A creek near the wash house. 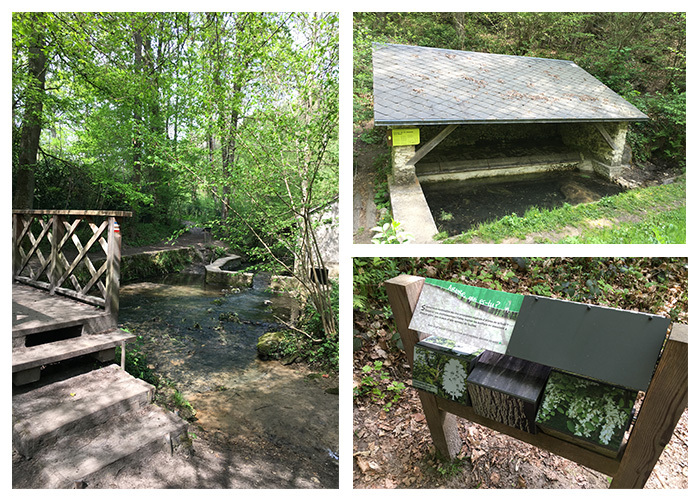 Top right: Lavoir de la Source aux Fées, an ancient wash house (translated as Fairies’ Source). 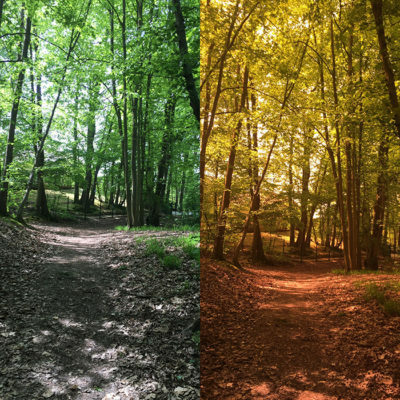 Bottom left: A little general knowledge of the trees grown in the forest. I now have a better understanding of the phrase “seeing the world with rose tinted glasses.” The world does seem to be a prettier place when it is seen through my tinted sunglasses. When we hit midway, we reached our first and only early exit, at Coignières, a small quiet town. We were running low on fluid, with us bringing only 1 litre each. The only supermarket that was opened on Sunday, closed at 1pm – the exact moment when we reached there. A fleeting thought of just terminating the run crossed my mind. However, not wanting to waste the good weather and that we saw an open bistro to replenish our fluid, ensured that we continued with our original plan. Don’t know why the scene here reminds me of The Yellow Brick Road of The Wonderful Wizard of Oz. We were rewarded for not taking an early exit at Coignières. As we continued with the second part of the run, we no longer encountered any more forest, but just fields of young green wheat stalks and bright yellow rapeseed flowers. It was an amazing sight, especially with the fields of yellow rapeseed flowers; the fields were so expansive that they stretched to the horizon, as if there were nothing else in the world but rapeseed flowers. 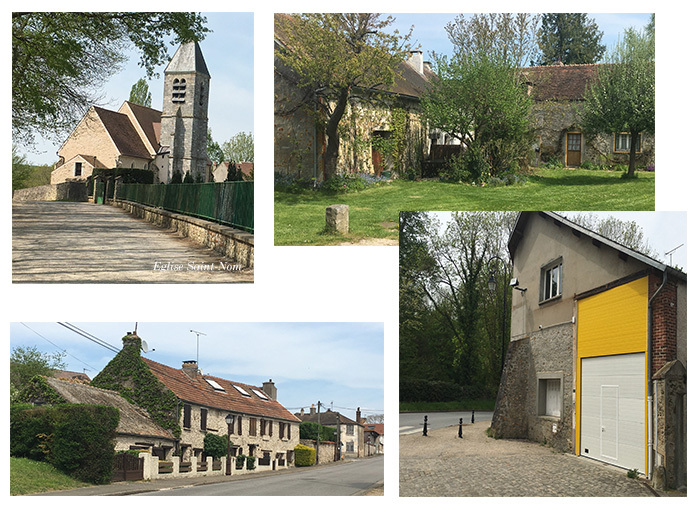 Top left: Eglise Saint-Nom, situated in Lévis Saint Nom commune, was constructed between the 11th and 12th century. Others: Various residential houses that caught my attention, especially the one with a white door against yellow wall. A selfie! Wonder when will the next GR be. Stay tuned! 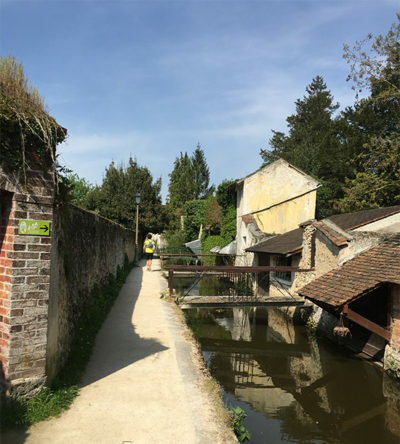 By the time we finished our run at the train station of Villiers-Neauphle-Pontchartrain in Villiers-Saint-Fréderic commune, we were famished. All we had during the 5h run was some small cereal bars, an energy gel, water, energy drink and a coke shared between us. Like most places in France, no shops nor restaurants were opened on a Sunday. It was remiss of us not to have brought additional food for the end of the run. Even though the whole run took less than 5h, the whole trip took almost twice as much time as that! To get back home, we had to change train 3 times. Due to the infrequent train schedule on a Sunday, we had to wait an hour for our first train to arrive in Villiers-Neauphle-Pontchartrain. Our second train was delayed by an hour as the train had to be stopped while waiting for the staff to apprehend a man who was loitering on the tracks. By the time we got home, it was already 7pm, 9 hours after we left our flat this morning! Nevertheless, we were glad that we completed what we had set out to do. Our plan is to finish the entire GR11…one day. If we complete an average of 30km for each run, it will take us 23 runs. If we undertake a GR run once per month, it will take us close to 2 years to complete the GR11. Let’s see how it goes!